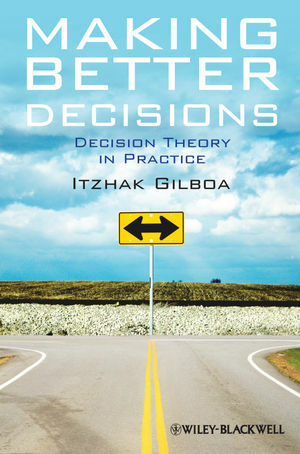 Making Better Decisions introduces readers to some of the principal aspects of decision theory, and examines how these might lead us to make better decisions. Itzhak Gilboa is a chaired Professor in the Department of Economics and Decision Sciences at HEC, Paris and in the Eitan Berglas School of Economics at Tel Aviv University, and Fellow of the Cowles Foundation at Yale University. He previously held the position of chaired Professor at the Kellogg School of Management at Northwestern University. Gilboa’s research focuses on decision under uncertainty. He has worked with David Schmeidler on axiomatic foundation of non-Bayesian decision theory and contributed to research in complexity in game theory, evolutionary game theory, and social choice. He is co-author of A Theory of Case-Based Decisions (with David Schmeidler, 2001), and author of Theory of Decision under Uncertainty (2009) and of Rational Choice (2010).